hehe yes it's bloody difficult especially lower league. I was playing as Ayr in Scottish league 1, I got them promoted within 2 seasons to the SPFL and then managed to score a single point the following. To the people saying it's too easy - HOW?? lol. I don't know what the answer is; I haven't found any consistency yet. It's really not proving difficult for you - you've done extremely well! Ayr getting to the prem that quickly should be a 1-in-100 kind of thing. But once you're there unless you've got a huge cash injection or get very lucky with quality loans and free agents, you're just going to get destroyed - your squad simply isn't good enough. Yeah struggling as lower league teams doesn't mean you're bad, it just means that its VERY HARD to do fantastically well down there. Especially for the Air guy, the double promotion is amazing, don't feel bad at the relegation, hopefully you got enough extra income from being in Scottish Premier League to either go right back up or be a top end Scottish Champ team for many years while you get your infrastructure ready for the true leap to the big league. Now if you took over Celtic and got relegated........then you might just be bad. I’ve found pausing the 2D match engine to see what positions the opposition is taking up to be the best way to get better results, personally. Gradually I think I am learning how to deal with different formations, to give me a better chance of winning. If they have one or two deeper midfielders then I try to play down the wings. If they are attacking with wingers further forward I defend wider. If they are defending deep I drop in a CDM to pick up their clearances and try to pin them back. 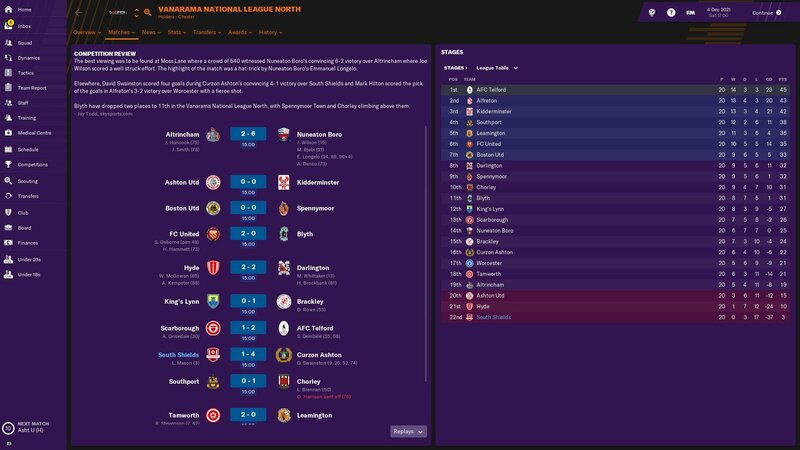 I’m currently 9th in the Vanarama North, in my first season, so doing about as well as expected. The difficulty level feels good this year. FM18. Haven't transitioned to 19 just yet. Another thing to remember is that expectations for managers in real life are stupidly high. If the game had a realistic difficulty you would be doing significantly above average to stay in a job in the English league for over two years, and sackings within a few months would be commonplace. 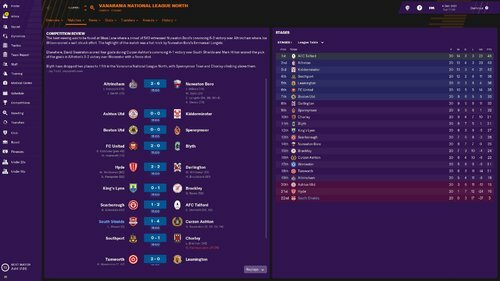 This year seems really tough in the lower leagues, especially with part time teams. 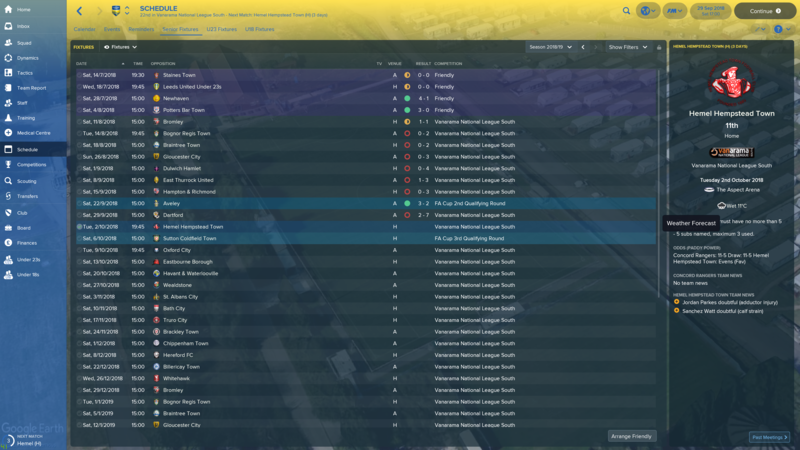 I have started with Hemel Hempstead, and the board want play-off, media prediction was 7th... so I am in 16th (in Jan 2019) and have been in/out relegation zone pretty much all season. Luckily I have recently had 2 back to back wins, otherwise I would be firmly in the mix for the drop. I have found it hard to get the training right when you have only got 2 or 4 sessions per week, and the players are all unhappy with it. Not complaining though because I love a challenge, but it seems to be the toughest FM that I can remember. Rubbish FMers of the world unite!! Yes I like to read about people's struggles and then hoping they continue to post their struggles or how they are slowly turning it around! After posting this, I have won another 3 on the bounce. I am not sure what triggered it but I started doing quickness training at least once per week, and alternate the tactical/technical attacking sessions in the other slot(s). Although it has projected me up to the lofty heights of 12th, my board confidence is still only 30% and I am still getting the "under fire" description on every pre match email. Can't see me lasting the season unless I carry this on. Board still expect play-off place but I am 13 points behind 8th, and I have got some tough games coming up. What are people's experiences when they haven't met their league expectations? 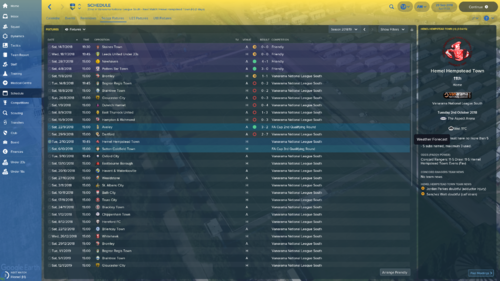 If I finish mid-table, would I be likely to get another contract?